Kiaundra Jackson is an LMFT with a private practice in Los Angeles. She focuses on working with couples and was recognized by the Huffington Post as one of “10 Black female therapists you should know.” You can learn more about her here. 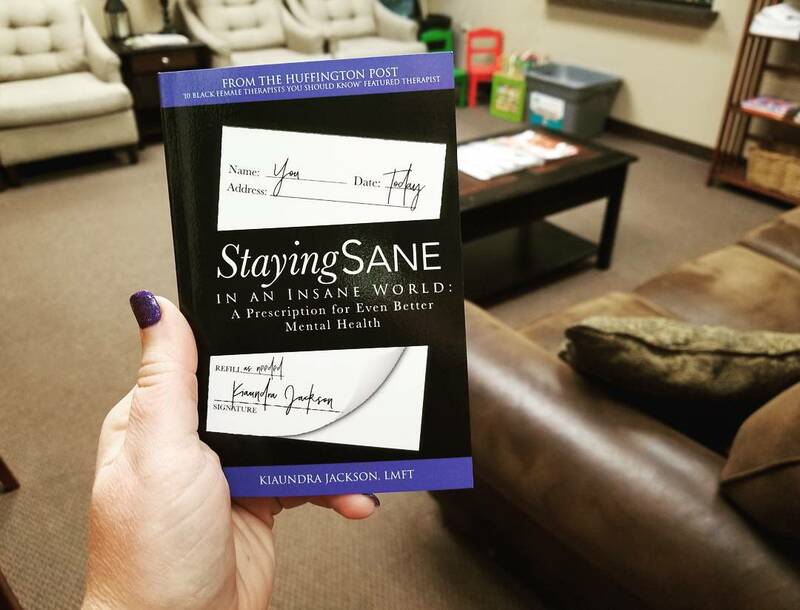 Staying Sane is a pocket sized book with mental health care basics. Kiaundra outlines common depression symptoms, treatment options, and coping skills. She also explains how to find the right therapist. This book seems like a great marketing tool. It is simple and to the point. Staying Sane also includes a list of 50 coping skills that are all free to do. The price point is a little high for giving it out but Kiaundra is working on putting together a bundle package and said she is willing to make a deal for anyone wanting to purchase multiple copies. Staying Sane in an Insane World is perfect for potential clients or those who are hesitant about starting therapy. Clients who struggle with depression, anxiety, or life and relationship challenges may relate to this book. However, it is not geared to those with severe trauma or severe mental illness.